Today it almost hit 80 degrees, so I took my ‘flower’ money and headed to one of my favorite nurseries. Big 6 packs (sometimes more included) are only $2.99 which I think is great. I cashed in coins we save in a can and got over $70, but used some, so had about $55 which I had no problem spending. Beautiful flowers. 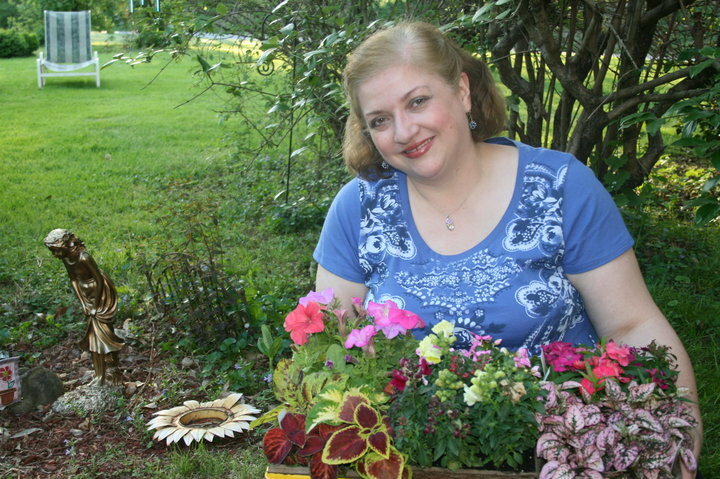 Here’s my annual photo of me with the annuals! (I thought that was pretty funny). I just got the bandana t-shirt at Tar*get Thursday night. Sean was off, so we went to visit my mom and went to BJs* Wholesale Club for a few goodies. We had shrimp pizza at Ber*tucci’s afterwards. I had some Cha*Cha money on my debit card (remember I answer questions as a human search engine), so I got some things at Home*Goods-a pretty box for my paper stuff, a small seashell mirror that sits on the table and a neat hat. It’s basically pocket money and it’s a treat to have it to buy goodies once in a while. I started to plant the pink polka plants and snapdragons last night, but it was a bit muggy and I gave up after planting a few. I didn’t buy any white flowers, so I need a few. They look neat at night. Hoping to go to a community yard sale later, another warm day expected.